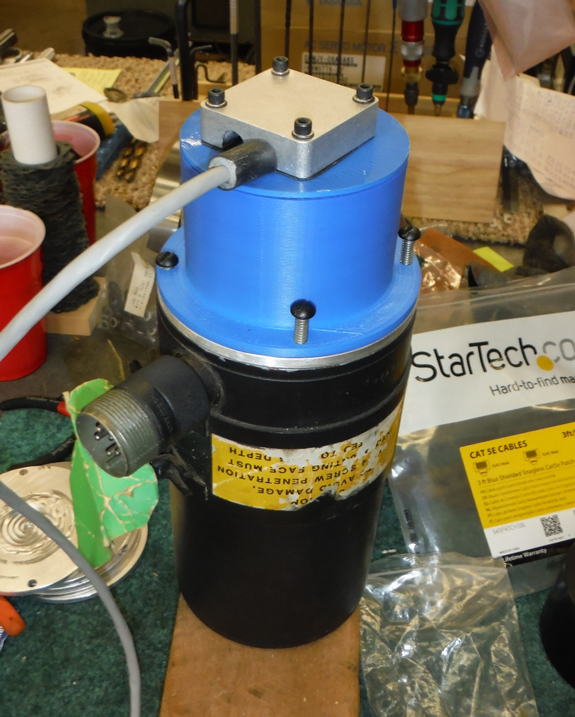 SEM DC Servo Motor Encoder Retrofit Upgrade, preparing the servo for the new CNC control. Step by step pictorial guide to installing a new Rotary Encoder and direct wire power and encoder cable on a 20 year old DC servo motor for use with a new Centroid CNC control. Before upgrade... After new encoder, cable and strain relief has been installed, motor is ready to mount back on the machine and run. With thousands of DC servo motor based CNC machine tools worldwide, when it comes time to upgrade the original CNC control with a modern Centroid CNC, significant savings can be realized if the existing DC servo motors can be reused. 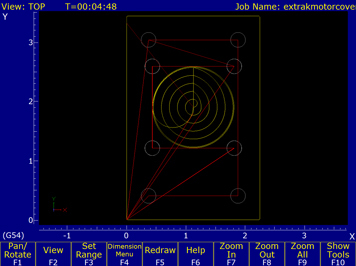 This can often be accomplished by installing a new rotary encoder on the existing servo motors. Over the last 30 years there have been a wide variety of makes and models of DC servo motors used on a wide variety of CNC machine tools. Many of these motors can return many more years of reliable service on the machine tool with an encoder upgrade. While each make and model of DC servo motor is a little different in design, the process of installing a modern high resolution encoder is often very similar from motor to motor. 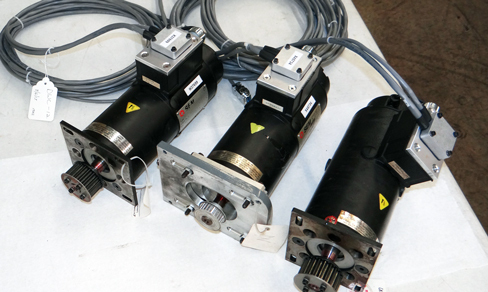 It is also common at the same time as the new encoder upgrade to install new servo motor power and encoder cables. With a Centroid retrofit it is very uncommon to reuse the original DC Servo Drives as Centroid offers new modern digital DC Servo Drives that are made in USA, reliable, affordable and provide better performance than old DC Servo Drive technology. 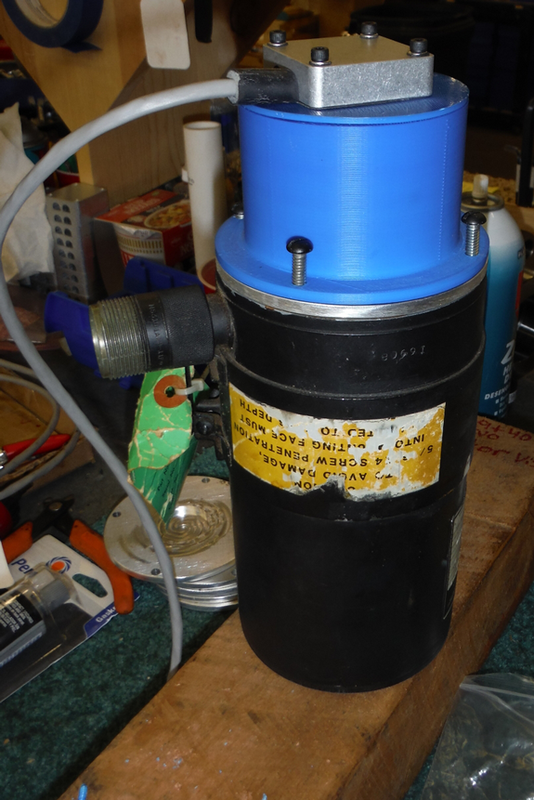 So, while it is economical to reuse the old DC servo motors , reusing old DC Servo Drives is not. Centroid's popular "All-in-1-DC" CNC controller, as the name implies, is a complete CNC control built on one printed circuit board and contains a built-in 3 axis DC Servo Motor Drive (up to 15 amps per axis!) along with a built-in preprogrammed PLC with inputs and outputs for common machine tool functions, analog spindle control and more. The SEM DC Servos on this web page are approximately 26 in-lb motors, we will be using the Centroid "All-in-1-DC" CNC controller. The "All-in-1-DC" can control DC servo motors up to 15 amp per axis with correlates to a little over a 40 in-lb rated motor. DC servo motor sizes that are commonly found on CNC machine tools are: 15, 26, 29 and 40 in-lb. While you can use the "All-in-1-DC" on DC Servos slightly larger than 40 in-lb's we recommend going to the Centroid "AC/DC Servo Drive" which comes in a 30 amp and a 60 amp (per axis) version for motors larger than 40 in-lbs. The "All-in-1-DC" CNC controller popularity is due partly to the large number of older CNC controls that used DC servo motors in the 15 to 40 in-lb size range that can be reused, such as Dynapath, Anilam, Fanuc, AllenBradley, Hurco and Bridgeport and more. . Many of these brands used SEM, Baldor, Glentek and other DC servo motor makes. Reusing the stock DC Servo motor with an encoder upgrade and the "All-in-1-DC" greatly simplifies cnc control installation and configuration. 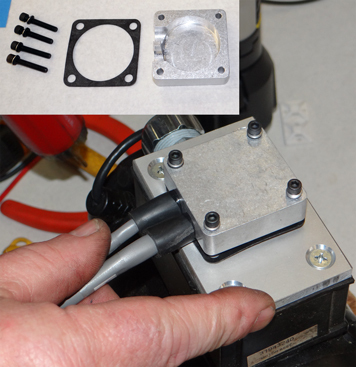 Link to SEM DC servo motor Encoder upgrade step by step photo album where you can download one or all photos showing the retrofit process with Captions. 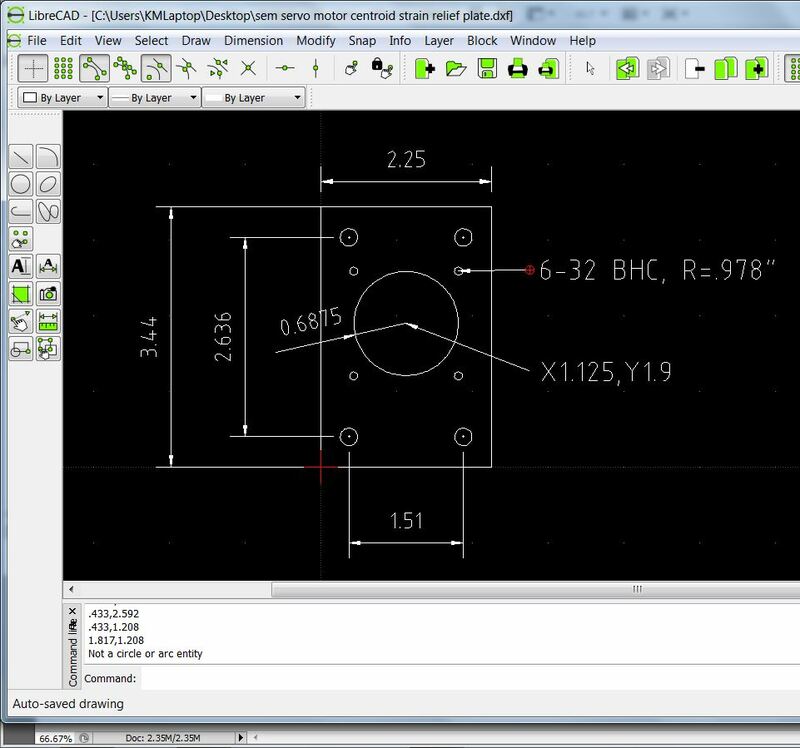 Download DXF drawing of SEM DC Servo Motor electrical box cover plate. Make your own cover plate out of .25" thick aluminum. This plate replaces the cover plate that the stock mil (canon) connectors bolted to and accepts the Centroid Motor/Encoder cable seal and strain relief for easy direct wiring of the servo motor. Use this Centroid "Intercon" conversational program to make SEM DC Servo Motor cover plates using a Centroid equipped milling machine. 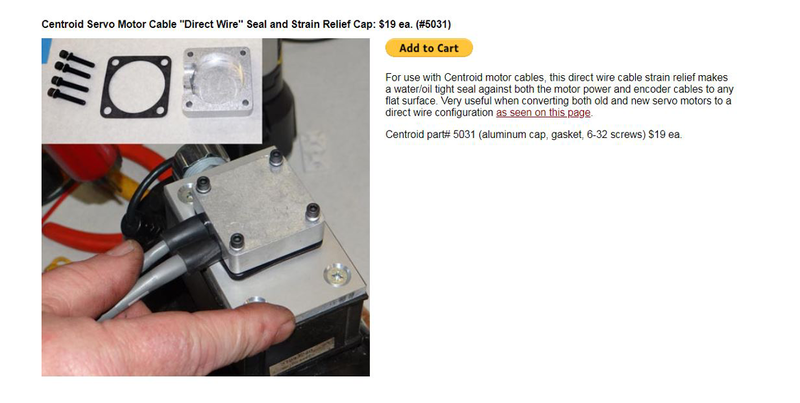 Centroid Servo Motor Cable "Direct Wire" Seal and Strain Relief Cap. For use with Centroid motor cables, this direct wire cable strain relief makes a water/oil tight seal against both the motor power and encoder cables to any flat surface. Very useful when converting both old and new servo motors to a direct wire configuration. Centroid part# 5031 (aluminum cap, gasket, 6-32 screws) $19 ea. Encoder Installation time for these SEM DC servo motors including the new power and encoder cable was 1.5 hours per motor. Machining the Aluminum cover plates took about 6 minutes per plate once the Intercon program was finished and the tools were set up in the machine. Total time about an hour with deburing and cleanup. We came up with these 3D printed DC servo motor encoder caps for the case when upgrading a DC servo to a modern encoder the existing motor end cap is too small. both the .stl 3d print ready file and solid model Rhino file is contained in the link below (solid model is included in case you want to modify the design to suit your particular needs). 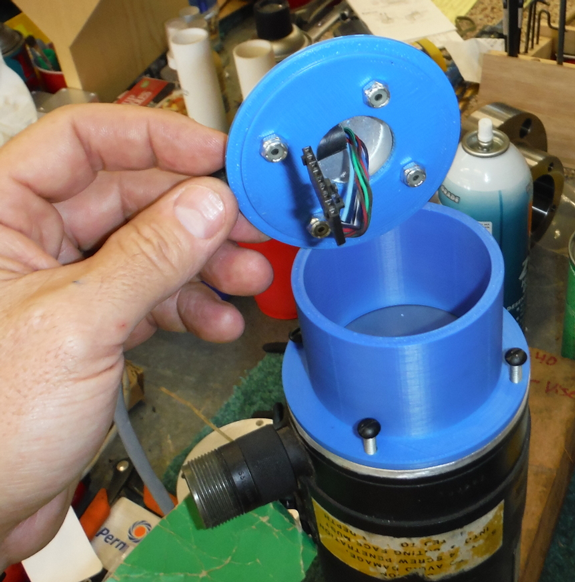 After a prefit, the blue end cap is ready to Glue/epoxy onto the blue main body of the 3D printed encoder cap to support and seal it up. 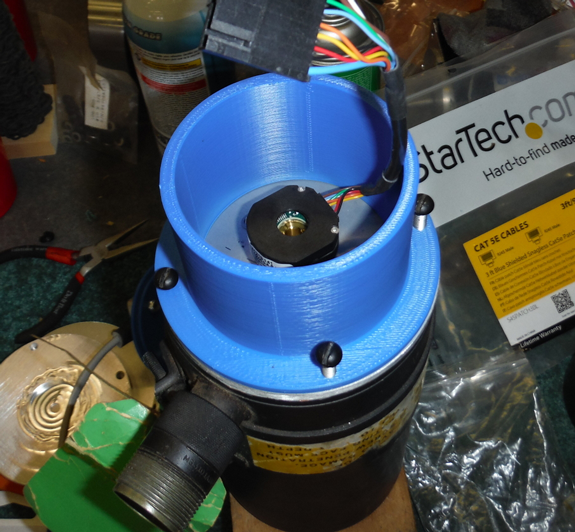 The 3D print cap design accepts the Centroid DC motor cable strain relief kit found on the Allin1DC webpage.